Transgender / Crossdressing Poll: How Often Do You Go Out in Public as a Woman? Stepping out publicly as a woman is one of the most powerful ways to validate your femme self. So how often do you do it? Do you live as a woman full time? Do you crossdress regularly or on occasion? Or is the answer (sadly): never? Please take my poll and share your thoughts in the comments below! 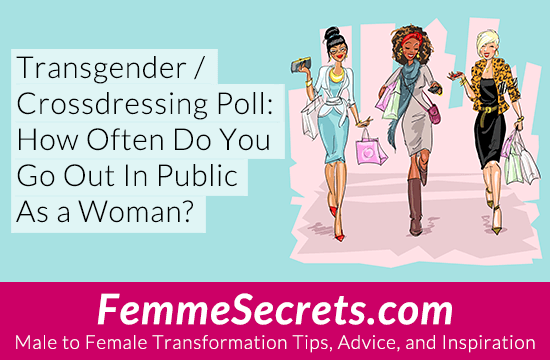 How often do you go out in public as a woman? 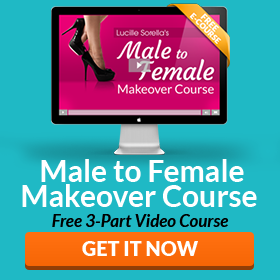 Click here to download my FREE “Unleash Your Inner Woman” MP3 – and discover how hypnosis can help you increase your confidence in your feminine self! I am retired, and 71 years old. I dress all the time at home, but only under dress when I go out. I do not think the family would approve of my dressing, so I stay in he closet. I promised my late wife that I would not go out dressed, so I am keeping my promise; also I have a Mustache that I have worn for over 50 years. I Love Ladies, and I like to crossdress. The type of job and bussiness i’m in, I can not dress as a lady in my work life. In my home and privite life I am fine with this. Some of my family like it when I show up at a family outing or partys dressed as a lady. It’s FUN. So anyhow, I have to share. I’m 72 and retired and pretty much live now as a woman 24/7. I love my life now. Today I was out shopping, here is a photo of me today in my shopping clothes and an older gentleman asked me out for a date! I thought it was cute, but I declined, told him I was married. It was pretty funny, but made me feel like such a woman!